North Carolina sculptor Patrick Dougherty predicts that his sculptures, which are not intended to be permanent, will last about two years. As he puts it, “You get one great year and one pretty good year.” To the delight of visitors, The Rambles lasted well over two years, including withstanding Hurricane Irene in late August 2011. However, by February 2012, wind, weather, and the process of drying had taken their toll on the cut wood that made up The Rambles. The breakdown of the western side, overall brittleness, and the collapse of the front screen of columns led us to decide to take down the sculpture in early March when it no longer seemed safe to leave it standing. Dougherty leaves decisions about dismantling his sculptures up to the host institutions. Although many people have asked over the past two years how we would ultimately demolish the sculpture—suggestions included a large bonfire—the safest approach was deemed to be pulling down The Rambles and hauling it away. Buried portions of the vertical supports will be left in the ground to decay and the grass will be re-seeded. Stay tuned for future outdoor sculpture installations at the Museum. 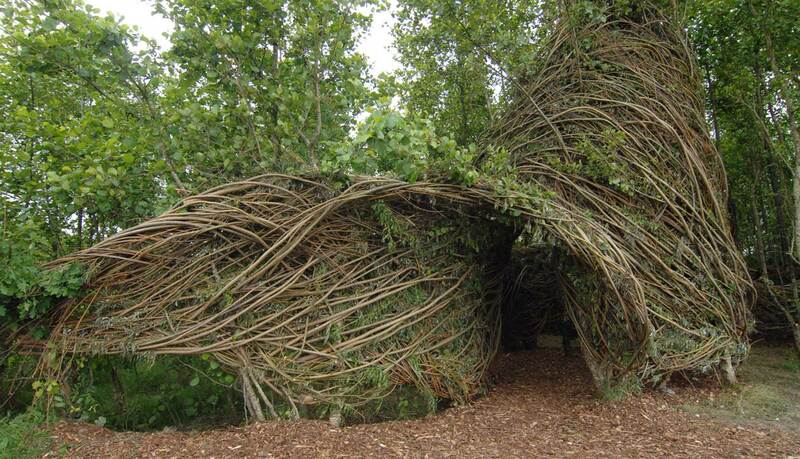 North Carolina artist Patrick Dougherty has created his monumental sculptures all over the world, but has never worked in Connecticut – until now! Dougherty, who has created large-scale environmental installations all over the world, spent three weeks weaving 6 tons of native birch and bayberry saplings together to form The Rambles. The sculpture, which is 21 feet tall and over 1,000 square feet, overlooks the Lieutenant River and can be seen from most points on the site’s eleven acres. Nearly 100 volunteers helped in the construction process. Most of Dougherty’s works are temporary, weathering the change of seasons and enduring the elements for one to two years. The Florence Griswold Museum’s installation has been made possible through the support of the Connecticut Commission on Culture and Tourism and People’s United Bank. The Museum is also grateful for the support of Andy Baxter, David and Mary Dangremond, and Renee Wilson. Dougherty likens his process to an artist sketching a picture. “Anything you can do with a pencil and paper, you can do with sticks,” he has remarked. He constructs his installations using local saplings to “sketch” structures that interact with nearby buildings and trees, introducing notes of whimsy and visual energy into familiar settings. Dougherty explains, “ I have learned to use saplings as lines and full-body motion as a kind of pencil.” Groups of large saplings are set into the ground every few feet and used as posts. From there, more saplings are woven together in different directions to form walls nearly a foot thick. No nails or fasteners hold his sculptures together—just the tension of the woven saplings and sticks. What sets Dougherty’s works apart from other sculptures is how the community is engaged in the project. Volunteers are a key part of the process. For the Museum installation volunteers – a diverse group of high school and college students, business professionals, artists, seniors and Target employees – from all over the state came to aid in the construction. Called “the Jackson Pollack of saplings,” Dougherty looks to the layout, history, and “personality” of the site to guide his design. For The Rambles, Dougherty imagined a Victorian garden folly, many of which resembled architectural ruins and borrowed from the assorted shapes that make up the Museum’s Krieble Gallery. Two towers, one square, the other round, flank a maze of walls and archways. While the shapes are very distinct, there is a feeling that the structures are being reclaimed by the natural world. Visitors are encouraged to wander through the towers and examine the sculpture from different vantage point. It was fascinating being part of the process. Patrick guided the project with such ease and made each of us see the importance of our contribution. This was a great opportunity to help our community art museum and work with an artist. Thanks for the opportunity to particiapte in such an amazing project - the process was almost as much an artpiece as was the final sculpture. Patrick was very patient and understanding with everyone. He'd come bend a stick and place it in the sculpture. You'd bend a stick and it would "snap"!! A fun experience and proud to be part of it. We thank you for the volunteer opportunity and are glad we could be of help. My daughter and I visited the fabulous project last week, and we loved it. The stick works project was a completely amazing experience and opportunity! Working on stickworks was one of the most fun and rewarding volunteer experiences Ive done. It was amazing to see the transformation each week. Working with Patrick was a real learning experience. When he commented that I did nice work..I thought to myself..if my work is nice...imagine what his is!! The work is entitled The Rambles, and I am proud of the sculpture that resulted from my residency. With the museum’s help, I was able to find and gather birch saplings from several sites around Old Lyme, Connecticut, and transport them to the museum. Volunteers removed the leaves from the branches and then proceeded to help with the weaving process. I use the infuriating tendency of branches to entangle with one another as my method of joining and then worked at a breakneck speed to complete the sculpture. The work, encased in scaffolding during its construction, provided working platforms but also aided in the bending and tying of the larger support saplings into the desired shape. Ultimately all strings were removed and the smaller saplings, which had been intertwined by volunteers, secured the work. I thought of the sculpture not only three dimensionally but also concentrated on the outer surface as a canvas on which to draw. Sticks are the material of bird nests, but they are also bundles of lines. All the drawing conventions used with paper and pencil still apply. I was given a beautiful site—behind the museum, but still visible through the large window wall in the lobby-gift shop. All in all, visitors need only walk a short distance to enter and explore the work. The sculpture is sited to take advantage of the bucolic view of the Lieutenant River, a classic vista for the painters who visited Florence Griswold so long ago. When I began to search for an image or a starting point to guide the creation of the work at the Florence Griswold Museum, I imagined the garden follies of previous eras. In the past, those who had means sometimes festooned their gardens with strange architecture and even built intentional ruins. These structures were meant to evoke mystery and stimulate a longing for bygone days. They offered a kind of poetic drama as nature reclaimed the manmade. I have been intrigued by ruins all over the world because vine cover, tree roots and unruly branches are often the first blush of architectural decay. For me it is like throwing a dust cloth over a piece of furniture that can obscure the detail but cannot deny the basic manmade form. With this in mind, I envisioned a kind of drapery for the museum’s imaginary ruin—one with a 22’ high round tower, a square tower and many architectural features in between. The viewers are invited in to explore the interior, to walk in some doors and peer around others. In The Rambles, the energy of the natural world seems frozen in the drawn surfaces as all the unassuming sticks gathered by the volunteers in the first few days take on presence and new meaning. With only a hint of underlying geometry, this backyard folly has no core of stone or wooden beams. As the scaffolding was removed on the final day, it was as if an insect chrysalis had finally opened and an enormous sapling slipcover had been shaken free and set out to dry.